In August 2005, Mr. Osmanagic had (on his own funds apparently) a series of drillings done on Visocica hill, with the aim of confirming his "hypothesis" of the pyramid of the Sun. The results are presented in three different documents, and with some nuances: first of all in the report of October-November 2005 by the geologist Nadija Nukic, engaged by Mr. Osmanagic; Ms. Nukic’s results are then included in Mr. Osmanagic’s book "The Bosnian pyramid of the Sun" published in December 2005; and finally these results are again partially used and criticized by the geologists of the University of Tuzla who have, at the invitation of the Foundation, made in April 2006 a report on the geology of Visocica. Let’s begin with Ms. Nukic’s report; it can be downloaded in bosnian (bs)  as well as [in english (en)>http://www.piramidasunca.ba/ba/images/stories/izvjestaji/egeoloskivisocicaokt2005.doc]  on the Foundation website. In fact, it seems that there are two reports: the one that is on the Foundation website is only about three probe holes (2 meters x 5 to 9 meters), but there probably is another one, from September 2005, containing also the results of the drillings (6 drillings about 40 meters deep), and that the geologists from Tuzla seem to have read. Then Ms. Nukic exposes her plan of research; here again I think that a stage is often forgotten; for instance, one of the questions Ms. Nukic searches an answer for, is to know wether the "manufactured" sandstone slabs on the "entrance of the plateau" were set "in the form of a staircase or whether the slope line was closely followed in the pavement process". Should not one first verify wether these sandstone slabs have actually been worked by man, and wether their disposition could be natural? This problem happens several times in Ms. Nukic’s report: she regularly postulates the existence of the pyramid, and searches about its methods of construction rather than about its existence itself. Then the report describes the probes and their results: the first probe is not convincing, as it is quickly seen that it is made in an area that was much disturbed during the war; however, it allowed the finding, a little bit higher on the slope, of "breccia" blocks "ordered like bricks in a brick wall - the upper block was moved inwards in relation to the lower one". The second probe was meant to verify wether the sandstone slabs were manually polished; unfortunately, the works have been stopped - the report doesn’t explain why - before an answer could be found. 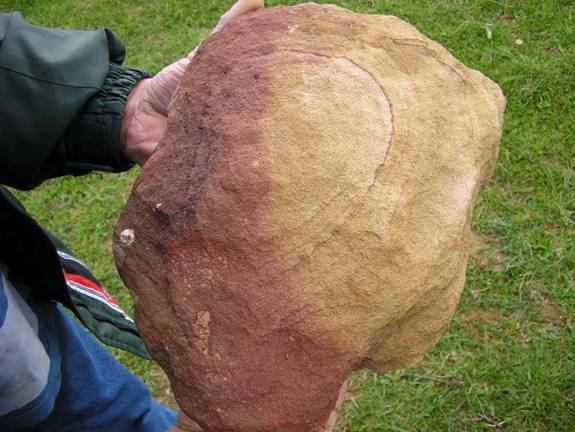 However, we learn that a sandstone slab "with clearly visible concentric circles" has been found at the depth of 70 cm. Without a photograph (the report is illustrated with nothing more than a vague drawing), it is not easy to guess what it is. Is it the same kind of "ornate stone" that Mr. Osmanagic found when he first came to Visocica in April? Or is it this kind of stone? The third probe was aimed at a definition of the construction method of the "access plateau"; there again, after having noted that the sandstone slabs are all inclined of about 25°, Ms. Nukic doesn’t ask the obvious question (is it the natural dip of the layers in this area? ), but prefers to ask whether it is possible to explain this slope with a supposed "landslide"... However, we can learn there that this third probe offered a discovery that could have been significant: the discovery of two human skeletons, incomplete ones, set between sandstone slabs. For an archaeologist, the discovery of a burial is always extremely important: it can allow an absolute datation, and the precise study of the method of burial can deliver a lot of information about the studied culture. All that we will learn about these skeletons in Ms. Nukic’s report, is that they were photographed by an archaeologist (who? no name is given; and where are these photographs? the Foundation is lavish with photos on the website, but then I couldn’t find even one photograph of the skeletons ...), and that they were "sent to analysis in order to determine how old they were". Since August 2005, no news at all: where are these skeletons? have the analyses been processed? by whom? what are the results? What could this lack of information imply: that the skeletons were lost? or that the results were not compatible with the official version of a 12,000 years old pyramid? The most strange is that Mr. Osmanagic sometimes announces (en) for the fall of 2006 datations of organic material, but at other times he says (en) to a journalist from The Independant (on 2006, April 28) "We have yet to find any organic remains, bones, wood or coal"... This kind of inconsistency shows the levity of the Foundation, and could justify the worry of some archaeologists, who are seriously afraid that some archaeological material could be destroyed during these excavations. Here, Mr. Osmanagic notices a first anomaly at the depth of 3,70 m: "the clay grades into indurated marl which is geologically almost impossible over a very short period of time - this cannot happen over 20,000 years". Then, nothing: the result of this visit is mentioned nowhere on the Foundation website, nor the press conference (en) that was held on the 8th of May in Tuzla by these geologists. These geologists’ report, ignored by the Foundation (which had ordered it), has been found by "Stultitia" (bs), one of the Bosnian "AntiPyramid Web-Ring" (bs) bloggers. You can download it on her new blog (bs) (link "Izvjestaj Rudarsko-geolosko-gradevinskog fakulteta u Tuzli"), or below (the text is in Bosnian) . What does this report say? The seven geologists of Tuzla University had the opportunity to read the complete report by Ms. Nukic (describing the probes and the drillings). They make a summary of this report (discreetly pointing at some of its lacks), then they compare it with how Mr. Osmanagic used it (see above). The most interesting is that Mr. Osmanagic seems to have, for the needs of his book, invented or exaggerated some "anomalies", which did not appear in Ms. Nukic’s report, or at least did not appear as "anomalies". If one looks closer at the two examples of "anomalies" mentioned above, for the first one ("the clay grades into indurated marl which is geologically almost impossible over a very short period of time - this cannot happen over 20,000 years"), the Tuzla geologists note that "Geologist Nukić does not list this as an anomaly. The profile of B-1 at 3.7 m the clay grades into indurated marley clay, which is completely natural". For the second "anomaly" (the "mixing of marl, sand and black traces (organic material)"), they note that "Geologist Nukić described ’clay, marl and coal with sand and gravel’ but she also stresses caving in of the boring could have occured". So, the "anomalies" mentioned in Mr. Osmanagic’s book were not such in his geologist’s report (even if, as said above, Ms. Nukic however admitted from the start the existence of the "pyramid"). the Egyptian geologist Mr. Barakat, who stayed an entire month on the terrain, seems to maintain his position that Visocica is, if not a "pyramid" made by man, at least a hill that was largely "arranged" by man. In front of these two contradictory positions, one can notice that, if Mr. Barakat has the advantage of a longer stay on the site, the Tuzla geologists have for them the advantage, compared to their Egyptian colleague, of the knowledge of local geology! An English translation had been provided by "geolog-mrak" (en), another blogger and geologist from Tuzla himself ; but since his blog disappeared, you can find a copy here. See here for a more detailed explanation of Visocica and Pljesevica geology.